Born in 1968 as Heather Frith, her father's family is one of the oldest in Bermuda, with their history on the island going back 200 years. Heather's mother is Canadian and the name Nova is a surname present on that side of the family. Heather spent most of her childhood sailing off to sea in a 40-ft boat, with her parents sister and brother, a dog, a cat and a power generator, the latter one being useful to blast off her family's records. Heather quickly showed an interest in music, and started learing to play the guitar and violin and writing songs at a very early age. Her first recording was a four track EP entitled "These Walls" released in 1990. 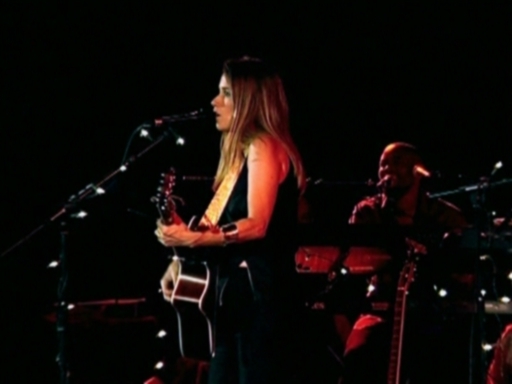 Heather Nova's music was brought to the attention of our editorial staff by Evelyn Downing and Jamie Field (feature) earlier this year. The albums quickly went on extensive rotation in offices on both sides of the Atlantic ocean. The run up to Heather's 2003 release Storm inspired a collaboration amongst several Musical Discoveries correspondents who contributed to the construction of the indepth interview with Heather Nova completed in November 2003 and presented below. 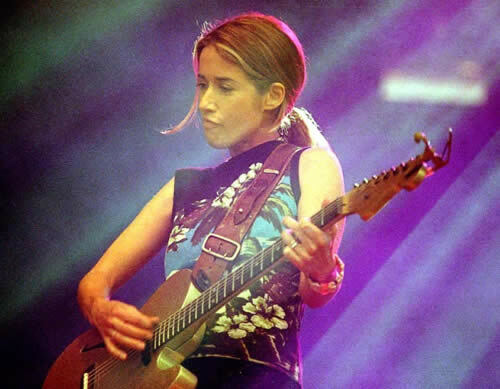 You are about to read an in-depth and retrospective article that reviews all of Heather Nova's (authorised) albums: Glow Stars (1993), Blow (1993), Oyster (1994), Live From The Milky Way (1995), Siren (1998), Wonderlust (2000), South (2001) and the new album Storm (2003). The article also includes reflections on Heather's live performances. 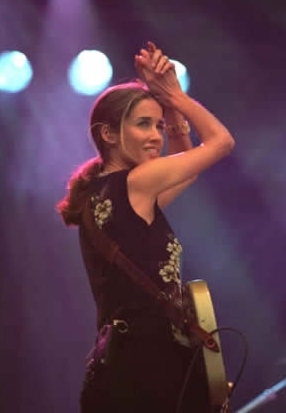 The worldwide web offers plenty of further information on Heather Nova including a vast array of photographs of this stunning vocalist. Go to the section "Album reviews" to read the music reviews. Musical Discoveries: Many of your songs contain highly personal and intimate lyrics. What drives you to express these feelings in song form? Heather Nova: I think the need arises simply from a desire to find clarity in my life. Somehow through writing I am able to learn things about myself, about how I feel. And it makes me feel more alive; more in touch with life. Writing is very much a process of searching and discovery. During the writing process do you start with the lyrics first or the music? I usually get a few lines of lyrics with a melody already attached. They are very much married from the start. sometimes i will think of a melody first but rarely a lyric. If that happens it usually becomes a poem instead. Do you have a songwriting 'process' as such, or do different songs demand different approaches? Well, some songs land in your lap; they seem to come through me and those are the lucky days, as they seem to write themselves, but more often I get, as I mentioned earlier, a few lines in my head and then I follow the thread to finish it. Sometimes it takes days or weeks to write a song - I keep coming back to it until it completely gels. Neil Young and Bruce Springsteen appear to have been influential to you since you have covered a few of their songs. What other artists have influenced you and what else are you listening to these days? The artists that have influenced me have been ones that take risks; that put themselves completely into their songs; the ones that aren't afraid to be exposed and dig deep and go to the dark side too. Over the years the ones that stand out are Kate Bush, Patti Smith, Dylan, Neil Young, Van Morrison and Chrissie Hynde. On a side note one of our correspondents wrote that he would love to hear you perform Neil Young's "After The Gold Rush." What do you think? That whole album is wonderful. I will give it some thought! The Glowstars album is definitely a rock album, yet only one track seems to use a drum kit and the percussion on others is sparse. The space and atmosphere created is brilliant. How and why did you and producer Felix Tod decide to do the songs this way? Funny, I don't really think of Glowstars as being "rock" - in a way it is more electronic. The beauty of that album in retrospect is that we were so limited that we got even more creative sonically than if we had had a full band and lots of gear. We made that album at home on an 8-track cassette machine and it was just the two of us, my guitar, a little keyboard and an effects box. A few friends dropped in and contributed bits of electric guitar and stuff, but we were literally set up in our living room. Felix was brilliantly innovative with the sounds. It seems like most if not all of the songs on Oyster are autobiographical. Can you describe where you were personally and spiritually when you wrote those songs? I had a few demons to confront. I had just gotten out of a relationship with a very abusive and controlling man and alot of the album is about finding my strength and freedom. There are some intense songs on there but overall I would say the mood is one of catharsis. No matter how dark a song is there is a sense of hope in my music I believe. I guess I see writing as a hopeful act in and of itself. With a song like "Sugar" it would seem that you would have the lyrics first since it's almost done in a narrative style during the verse and lyrically there is a lot going on. Can you elaborate on the writing process for this song? No, actually I was going round and round that guitar figure on my acoustic guitar, in a sort of trance-like way, and the words started coming. I like working with spoken word, mixing poetry with rock and roll. I want to do more of that. When the CD single of "Truth and Bone" was released you re-recorded the track for the single. What led you to re-recording this track with a different arrangement than the version on the Oyster album? Getting the production right on a song is a tricky thing because there is a real spirit to a song and it's a delicate thing, and sometimes you don't really nail it the first time in the studio. I wanted to try again to capture the feeling of the song with a different arrangement. Please describe how your music developed from Oyster to Siren. Well, with Oyster it was my first time in a recording studio. it was all new to me. I think I had more confidence on Siren - I knew what I wanted more in terms of production and I had just been on the road for 18 months and was inspired by the sound of playing with a live rock band. I wanted to capture some of that on the album. Do you think that the path from Siren to Storm was more of a straight line or was there a curve in the road? The whole of my career has been an evolution, though some albumsIi have liked better than others. I think that Storm is probably my favourite and South my least favourite, probably because I had so much interference and pressure from the label on South they wanted a hit, and that is no climate to make music in. I made Storm independently with no label and that was the best thing for the creative process. Were there times when you made conscious decisions about your the path your singing style has developed? In a way Storm was a return to my roots, to a kind of simplicity. On Storm I didnt so much want to rock, I just wanted to make something very atmospheric and beautiful and intense without being angsty. It is intensely honest album. sometimes dark, but not at all angry. I think from playing live for the last ten years I have become a better singer. I am able to give myself up totally to singing - to lose myself in it, and that's when I sing my best - when I really let go. What were your reasons for doing a remake of the classic "Gloomy Sunday" for the South album? I was asked to record a version of "Gloomy Sunday" for a film that was being made in Germany. The film was actually called Gloomy Sunday and was all about the song and the composer of the song. It was a great oportunity to try a different style; I loved singing with the orchestral arrangement. Who are the artists who've made an impression on you recently? Jeff Buckley made a real impression on me. Again, for his abandon and for putting all his soul into the music. I was impressed by Sandy Dillon, who I first saw play live a few years ago. She plumbs the depths, and writes beautiful songs and sings them with an extraordinary voice. I also listen to stuff completely unrelated to what I do. I loved the first Air album, and actually I am a big Eminem fan! I also go back to old favourites alot. Right at this moment I am listening to an old Joan Armatrading album. Some of the images of you used in the CD artwork are very beautiful, particularly on Oyster and Siren and they are almost works of art in their own right. How much do you have to say on the photo shoots and on which images are eventually used? I have a lot of say on photo shoots. Sometimes the final decision of which one to use on a cover becomes a pretty heated debate with the record company though! Are you happy to leave the production to other people or do you have input on the production side even if it's not credited on the albums? It would be impossible for me to just sit back and let someone else take control of my songs. It is always a collaborative effort. It's helpful to have the objective ideas of a producer, and in the beginning I relied more on that. With Storm though, it was more a collaboration between me and the band. In a previous interview you mentioned you would probably feel pretty strange talking in front of an audience without music. However, you performed at the Crossing Border festival in Amsterdam last year, doing a mix of reading your poems from The Sorrowjoy and singing a few songs. Was that an experience you would consider doing again? That was a real challenge for me. I was very nervous! But it's good to take risks. In the end I enjoyed it. What is the difference between reading your poems and singing your songs to an audience? I don't know. I think that ideally a poem is to be read to oneself from the page. It's a quiet private thing. During the reading I interspersed it with some acoustic performances of old and new songs. Singing calms me down! More recently you said you are on a personal quest, and that writing in itself is a quest, but it also clarifies emotions, situations. Are you at all afraid of finding the "secret" of life or of your inner-self? I mean, that everything becomes too clear? Isn't this the mystery that keeps us going? That we need to find hope and inspiration? Ha! That makes me laugh! I don't think I am in danger of finding too many answers. Life is such a big mystery, and every day there are challenges, but I do enjoy searching. 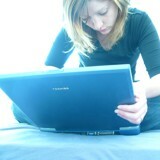 And sometimes writing is simply an expression of an emotion just for the sake of expressing it. What is the human need to express itself? I don't know - that too is part of the mystery. Now that you live in Bermuda again, is it easier to find inner peace to let emotions flow towards the pen, rather than in hectic London, or does it not really matter where you are? Has there been a change in the way the emotions find their way out? I imagine the surroundings influence the nature of the emotions, and as such the tone of the writings. It doesn't really matter where you are; that old cliche is true - inner peace is something you find inside. I have only had moments of it. It's like happiness - people ask you if you are happy but happiness only comes in moments. It is the harder times between that define the happiness. You have now done a tour in a semi-acoustic setting, which fits with the style of your latest album. Some older songs (like "Island") sounded like they have been made for this setting, it seems their delivery is even bigger than in a 'full band' setting. Is it right to say that a more stripped down set can actually give more contrast to a song? Does it bring you closer to the essence of the song? Yes, i really enjoyed this tour. Ironically there can sometimes be more intensity on an acoustic version of a song, without the big guitars. There is more exposure and that can be arresting. There are some songs that don't appear on your main albums. When can we hope to have a compilation album or a box set that includes these rare and beautiful songs? I would love to do that. I don't have total control over my back catalogue, however, as it is my old label who owns the recordings. Your performance of Neil Young's "Like A Hurricane" was performed in Hiroshima. How did the audience respond to it and what did you feel performing that song in this location? It was quite intense to visit Hiroshima. To think of what had happened there, and then to be an "American" playing there a couple of generations later. It made me aware of how people have the ability to heal and that love is the overriding human quality we have. It was humbling in a way. Do you think becoming a mother will affect your music in any way? Of course. Everything in my life affects my music, and surely becoming a mother has got to be one of the biggest things to experience. We have heard that one of your recent concerts was recorded for a future DVD. When can we expect its release? What has been your "greatest moment" in all your years as an artist? I couldn't put my finger on one moment, but in general it has been the live gigs - some of them have just had a magic; where there is a synergy between us on stage and the audience. Ultimately playing live is about a connection, communication, and sometimes you really feel it so strongly. What are your musical plans, hopes and dreams for 2004? I hope to make another album in 2004. I will keep you posted! Interview Credits. Our questions were prepared by regular contributors to Musical Discoveries: Scott Bassin (Nanuet, NY, USA), Russ Elliot (Endicott, NY, USA and Portsmouth, UK) Justin R Elswick (Provo, UT, USA), Evelyn Downing (Manchester, UK), Jamie Field (Hereford, UK), Jelger Groeneveld (Amsterdam, Netherlands), and Joseph Voncken (Herleen, Netherlands).